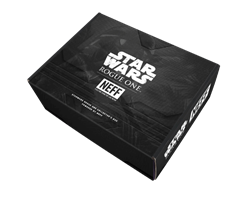 Neff and Rogue One: A Star Wars Story put together a limited edition box for Star Wars super fans. Neff CEO, Shaun Neff commented, “We’re super excited to further connect with the legions of global Star Wars fans and offer this unique box that celebrates the Rogue One: A Star Wars Story film – a first for Neff! Neff Headwear, LLC today announced plans to deliver a Limited Edition Rogue One: A Star Wars Story Collector’s Box to fans for the Holidays. The project has come together as part of Neff’s collaboration with Disney Consumer Products Interactive Lucasfilm Ltd. to produce a premium collection of co-branded apparel and accessories inspired by the new film in theaters this holiday season. The Box will be available only at NeffBox.com. Each Star Wars Neff Box will feature collectible Star Wars items, including: a Neff | Rogue One T-Shirt, Hats, Beanies, Star Wars themed Wobbler Bobbleheads from Funko, Star Wars comics issues with various cover variants, and more. Inside each box will also be a signed copy of James Luceno’s, “Catalyst, A Rogue One: Star Wars Story” novel that sets the stage for the December 16 film release of Rogue One: A Star Wars Story. This Limited Edition Star Wars Neff Box is $99 and is available now for the holiday season. For more information please head over to NeffBox.com.